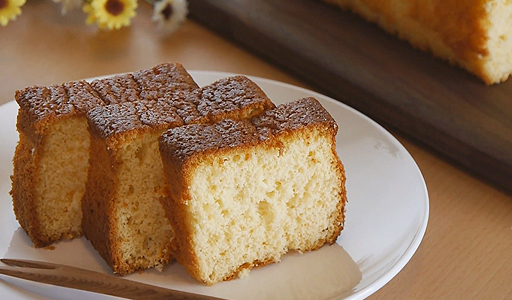 Castella is a popular Japanese cake that's loved by everyone. It's especially popular in Nagasaki, where you can find Castella being sold in almost every store. I remember the first time I went on holiday to Nagasaki many years ago, I ended up buying at least 10 loaves of Castella from different stores. I'm not even joking! Believe me, that was a lot of cake! 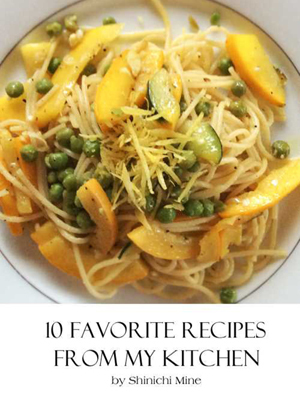 It did take us a few tries to get this right, but I think we finally perfected this recipe. This cake is light, airy and only needs 4 ingredients! It really is a simple cake to make and relies on simple ingredients. The sweetness comes from honey and that's all there is to it. To see just how easy it is to make, check out our Video Tutorial. CLICK HERE to see the video. So without further ado, let's get started. Line loaf pan with parchment paper on all four sides. Dissolve honey with warm water. Put 4 eggs and 1 yolk in a bowl. Whisk for 1 minute. Add sugar and mix for 1 minute. Whisk on high for approximately 10 minutes. Add honey mixture and mix. Add 1/3 of your flour into bowl. Mix until combined. Repeat two more times. Pour batter in loaf pan 2/3 of the way. Smooth top with spatula. Tap gently on counter to get out any air bubbles. Cut into batter with wooden skewer or fork. Bake for 5 minutes at 170 C or 340 F on middle rack. Lightly spray top with water. Bake for 5 minutes. Spray top with water again. Lower temperature to 150 C or 300 F. Bake on lower rack for 40-60 minutes. Check by inserting wooden skewer in the center. If it comes out clean, it is ready. Take out of the oven and cool for 20 minutes. Take it out of the pan and wrap tightly with plastic wrap. Refrigerate for 12 hours or overnight. When you are ready to eat, slice and enjoy!